In October, Echidna Giving launched a new website! The Puggle lives on our Insights page. We also hope you’ll check out the library of resources we’ve compiled and read about our strategy. Got feedback? Get in touch! The Malala Fund published Full Force: why the world works better when girls go to school, making the case for the G20 to invest in guaranteeing 12 years of education for every woman and girl. It argues that one billion girls and young women in low- and middle-income countries are missing out on the skills they need for the future of work. Although we agree with the call for 12 years of education for girls, we were excited to see the World Bank’sHuman Capital Index adjust years of schooling based on how much students are actually learning. The Index tracks how well countries are supporting their citizen’s education and health and how that impacts productivity. For education, the index tracks “learning-adjusted years of school,” which discounts years of schooling based on how much is actually learned. For example, in Tanzania students can expect to complete 7.8 years of school by age 18, but only 4.8 learning-adjusted years of school. 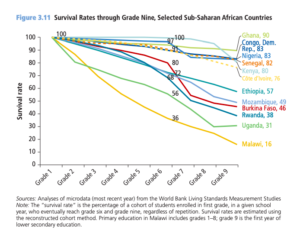 Another recent report from the World Bank, Facing Forward, documents how far most countries in Sub-Saharan Africa are from the 12-year guarantee that the Malala Fund is calling for given how few students survive even to grade 9. It is exciting to see a new report dedicated to adolescent girls in India, published for the first time this month by the Naandi Foundation. 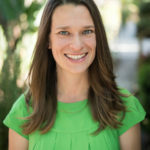 The Teen Age Girls report (and accompanying series of articles, 1, 2, and 3) shares findings from speaking with adolescent girls age 13-19 years across the country about education, health, basic life skills, agency, empowerment, and aspirations. The most striking part of the report was seeing how teenage girls from across socioeconomic classes are at a disadvantage thanks to gender discrimination. For example, as many as 52% of teenage Indian girls are anemic, and the rates are quite high even in the highest wealth quintile (42%). As the graph below shows, girls across the country also feel at a disadvantage compared to boys when it comes to education opportunities. For a great synthesis of the relationships between education and gender norms, check out a new ALIGN thematic guide on this topic. It shares evidence on how gender norms limit education achievement, how education changes norms and where it reinforces them and highlights examples and resources for gender norm change through education. If you’re doing work to end the norm of child marriage or know great groups who are, please pass on the Girls First Fund call for applications.